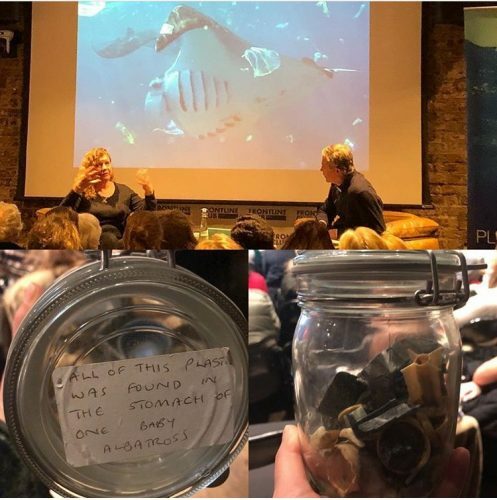 Stunning yet shocking images of pollution caused by plastics in our oceans formed the basis of an engaging discussion at the Frontline Club on Thursday 1st March. The evening was hosted by investigative journalist Oliver Steeds who was in conversation with film maker and executive producer Jo Ruxton. During the talk Ruxton shared some remarkable footage of her critically acclaimed film, A Plastic Ocean. The film which has been shown in 60 countries and won 15 awards was released in Jan 2017. Ruxton who also worked as a researcher for the nature documentary, The Blue Planet series, said through her film she wanted to understand the effects of plastics on our ecosystem and on human health. One of the slides from the documentary showed the effects of plastics pollution on sea birds by examining the carcass of a 90-day old albatross chick. 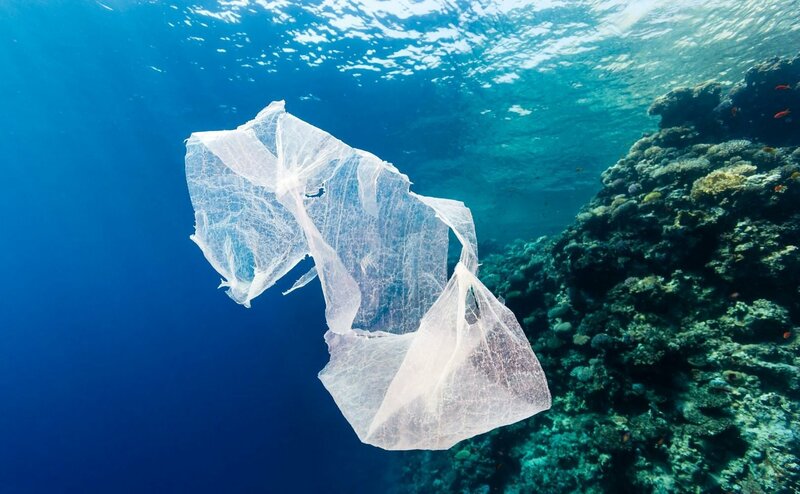 On closer examination of its stomach content revealed that it had swallowed 276 pieces of plastic, including an ink cartridge – according to Ruxton a small but symbolic proof of the everyday use of plastic’s effect in our oceans. Through research for the documentary Ruxton also explained that 50 % of plastics that go into the waterways comes from 5 Asian counties, China, Indonesia, Vietnam, Philippine and Sri Lanka…but that is only part of the challenge and part of the picture. In the Q&A session which followed the conversation a member of the audience raised the point about the degradation of plastic and Ruxton agreed that when it breaks down it never decays but gets smaller and smaller and its surface area increases and over time it becomes more dangerous. Another member of the audience raised a question about oxo-degradable but Ruxton pointed out that it’s not completely degradable and even bio-degradable means that it will disintegrate with a mix of plants which over time will disappear but not the plastic. 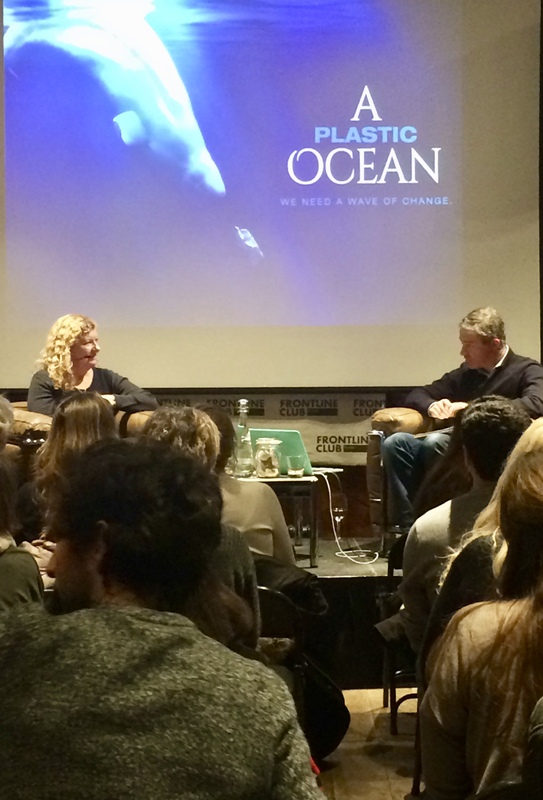 The talk concluded with members of the audience asking Ruxton and Steeds to join them for drinks in the members room where they raised more points about difficulties of stemming the flow of plastics in the ocean and reducing its use in their daily lives.